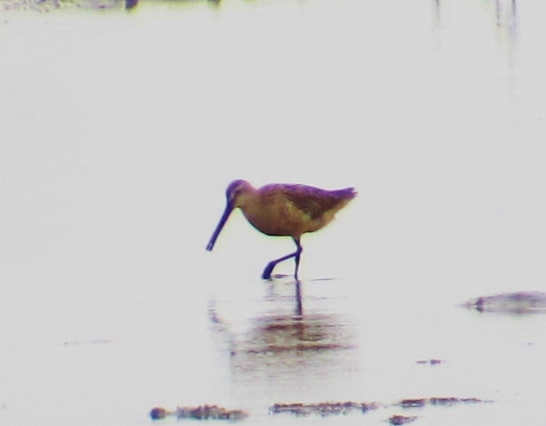 Asian Dowitcher at Dapeng Bay, September 19th – my fifth self-found individual of this rare species in Taiwan this year. A 1.5 hour morning visit to this site near Donggang in Pingtung County produced my fifth Asian Dowitcher of the year, following spring individuals at Aogu and Tainan, and two together last month at Budai. I have come to the conclusion that either I am incredibly lucky, or they are not quite as rare in Taiwan as the literature suggests. Aside from this obvious highlight, small numbers of terns on the mud comprised five different species. Two hulking Gull-billed Terns presided over two Common Terns (year tick), two White-winged Terns, and a handful of the expected Whiskered and Little Terns. Waders totalled 16 species, mostly in small numbers, including Terek, Sharp-tailed, Broad-billed, Marsh, Wood and Common Sandpipers, Long-toed and Red-necked Stints, Pacific Golden, Mongolian, Kentish and Little Ringed Plovers, Common Greenshank, Common Redshank, and Black-winged Stilt. Year tick: Common Tern (total 235).